Ants in Pants, Yes Yes! We are just about to start our second European tour, going to Finland, Latvia, Lithuania, Poland, Czech Republic, Germany, Denmark, Sweden, and back to Finland. We're doing the whole tour with HERO DISHONEST from Finland, who we met last fall in the U.S. They are a fantastic band, totally D.i.Y., and we look forward to every moment of this tour. HD booked everything, and they have done a fantastic job. Photos will be posted, along with news updates / tour diray postings. We will be playing from May 18th through June 6th. Check out the whole schedule. If you think can make it to a gig and need help finding things, email us and we'll try and get you there. We played last night at the Bottom Lounge in Chicago, opening up for NOMEANSNO. We all love NMN, and it was the realization of a "band goal" for us. We'd been bugging the local promoter, Brian Peterson, who booked NMN 4+ years ago, that if they ever came back, to put us on the bill. He did, and we were stoked (thanks Brian). Although the Bottom Louge is a "rock club" with that rock club feel (quite outside the type of places we usually play: basements/halls/lofts/squats) and some annoying rock club attributes (18+, $10 door), everyone there was cool, nice and fair, and it was probably the only venue that could have accomodated NMN's crowd. Many many of our good friends came out, some from across the country, and of course, legions of NMN fans. I hate band hero worship and think it's full of crap, but NMN have earned our, and most everyone's, respect for being unique, outspoken, down to earth, completely "themselves", prusing their band for no reward other than they love doing it, and, of course being "old guys" (in their 40's and maybe 50's?) that coompletely, solidly, rock harder and tighter than almost any band I've ever seen. It was good to be shoulder to shoulder with one of the best examples of what punk/underground/rock/diy can be about. Thanks to everyone who made it out. Some of you may have noticed that this site was defaced/hacked from about 9pm on Monday 21 until about 1/2 hour ago. Some script kiddie hackors used an exploit on an insecure script we use (NOT Geeklog -- that's very secure), and defaced the index page of many websites, including this one. Luckliy the damage was just a flesh wound, and no data was lost. Restoring this site took a few moments. Thanks to Pete from Mexican Cheerleader for alerting us to the damage. Crap! We were scheduled to play tomorrow night in Hot Springs, AR, but we've had to cancel. 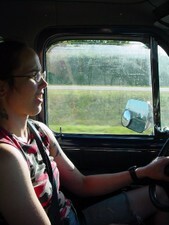 Our venerable 17-year-old van, the Fortress, has chronic oil leaking disease, and we may have to put her out to pasture. With no reliable van, driving to the middle of Arkansas for one show is outside of even our unstopable determined energies. It's a sad day to think that we are at the end of the road with the Fortress. It's been our home, our island of sanity on many a crazy tour night. We have NEVER missed a show due to the Fortress breaking down, until now. It has been the most reliable, comfortable, best laid out van we have ever toured in, either with FOURTH ROTOR or our other bands. Its a 1988 GMC Rally Wagon, with about 165,000 miles on it. It has a 2nd engine (used), but lots of body rust, and a weird vibration that we were never able to track down. Add that the current need for a major internal engine seal job, as well as possible piston/ring/valve/cam shaft repair, and that fact that it is on the original transmission, all means that it is getting beyond the point where repairing it any more is wise. We'll have to start the painful process of looking for a new (used) van to take her place. Please read this article by Steve Albini, "The Problem with Music". After reading this seminal article years ago, it has come to my attention, and chagrin, that there are many, many people out there in the "DiY" scene who haven't read this before. And worse, there are many, many people, young and old, involved in the 'underground scene' that still seem to think that signing to a major label is a good idea. If that's you, YOU'RE WRONG. Not only are you out to get screwed and used, you're empowering the music business, which is about business and money, as opposed to DiY, which is aobut expression, ideas, and music. Steve puts it all together so clearly and concisely, that I haven't seen it stated anywhere better. Since we met them in Chicago last October, we've really been into HERO DISHONEST from Finland. 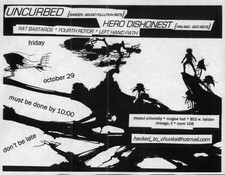 We played a show with them at DePaul University w/UNCURBED (Sweden), HERO DISHONEST (Finland), RAT BASTARDS, STAR SPANGLED BASTARDS, and LEFT HAND PATH. Since then, both our bands were talking about trying to tour together, and now it's finally happened... ... HERO DISHONEST were already booking a tour with another band from Brazil, but when they canceld, they let us know there was room for FOURTH ROTOR to squeek on. So we did. Info will be posted and updated here, but for now, the shows / dates look like May 18th - June 5th, going to Finland, Latvia, Lithuania, Poland, Czech Republic, Germany, Denmark, Sweden. It looks like we're going to play one or two places that we just played on our last tour, so we'll get to meet up with some of our new friends. YES!!! Once again, here's another new version of our website. it looks a lot like the old one, and that's intentional. One important change in the new site: in order to post on the forums, or leave comments, you have to log in. To do that, you have to become a user, by signing up for an account. It just takes a second, but it assures us that there's a real human being posting or commenting, and not a spambot. There will be some rough edges for a week or so while we hammer the new engine into place and make all the links work.... Why the switch? Some of you may recall that a couple months ago, this site was attacked by forum and comment spambots, who placed thousands of links to gambling websites all over the site. They were able to do so, becuase the old site didn't require people to register before commenting or posting in the forum. We liked the openess of the old system, but clearly we needed to do something. So, we have now switched to a different site engine, called Geeklog. It's one we used to use a long time ago, went away from, now we're back with it. The biggest advantage is that it has built-in anti-spambot protection, so we should be able to stop, or easily clean up, any spambot attempts on the site in the future. So please, sign up for a new account here. It's quick and painless, and will allow you interact with us and give us your feedback. Jake sang all the songs on our last show in Czech Republic. It was in a little, tunnel shaped bar in the town of Vsetin. It reminded us of playing a show in a submarine, except in submarines, there's less beer and smoking (I think). We had a major party/blowout with our hosts, involving lots of slivovice and vodka, and learning a dictionary full of Czech cuss words. Our friends were absolutely great and fantastic hosts...We had a day off, and a long way to go until our next show in Stuttgart, Germany, so we went back to Prague, stayed in a cheap motel, and went into the city to explore it once again. It was "spend a little money on a good dinner" night, and we all had good food. The next day, we arrived at the youth/community center in Stuttgart. This was a fairly large complex with many rooms for all sorts of activities (bars, dining, game playing [ping pong, fusball, etc], athletics, internet, and of course, performance space. The show was on Monday, and once again, it was just us two out of town bands. Thus, not too many people arrived, but the show went fine. I (Douglas) was in better shape vocalwise, and started to sing a few songs again, with Jake covering the rest. The two bands split up that night, with Fourth Rotor walking to the house of a friend of the promoter's for sleeping. It was a large loft-like space rented by about 11 people. They had a large band sleeping area, as it seems they offer their space for touring bands a lot. In the morning we reunited at the house for a big breakfast, and headed out for the next show in Geneva, Switzerland. One of the concerns with going to Switzerland was that it is NOT part of the EU, like everywhere else we'd been. So we were concerned there would be some customs problems with the merchandise (CDs, records, T-shirts) we were brining in. At the border, we were stopped, but they let us pass after a passport check. Driving to Geneva, we were expecting to see lots of mountians and have steep roads. It turned out that the northern edge of Switzerland where we were, really only has some foothills at most. We pulled into Geneva, and found the venue with little trouble. This place was right in downtown Geneva, along a river that flows out of the big lake. Once a squat, it has been legal for a long time. It is a big stone edifice, about 5 stories tall, and houses everything; a large performance space, several bars, a record store, band/artist's dorm, and much more that we never saw. This was the most "big club"-like place of the tour, with a huge stage, amazing PA system, digital MIDI light board, a "backstage" with showers, couches, and fully stocked with beer, juice, fruit, bottled water, cheese, chocolate, bread, etc etc. We were joking that it was like someone won a Guitar Center "solo" contest, and the prize was going to "rockstar camp" in Geneva for a night for you and 8 of your friends. Although the amenities were nice, it was a bit awkward for what we're used to and are about. Nonetheless, everyone was especially nice to us, and when the show kicked off at about 10:30, there were actually a few people there, despite, once again, there only being the two non-locals playing. (Note: unless all the mentioing of this is not clear, NEXT tour we are going to insist on playing with at least one local band every night -- it is more fun for us, and it should bring in more people). I was playing on a borrowed Fender combo amp that night, that would just shut off every 5 or 7 minutes. By the third time of that during the set, I moved over to another amp that was backstage, and finished the set without problems. My voice was back up to speed, and despite the technical probs, we did well. The night afterwards went on for a long time, with the show promoter/soundman/jack of all trades Damien opening up his record store to us, and supplying anohter case of beer. He was an interesting guy, in five bands,and had a great selection of music. We drank, played records, and talked into the night. We finally made it to Prague, a city that many people had been encouraging me to visit for years. They were right: it's an incredible place. We had an entire afternoon to explore, and while that is a pitifully small amount of time to explore any city, when you're on tour, it's often the best you can get. We had a great time looking at the bridges and buildings and restaurants and people. That evening, we made our way up the hill to the University campus that looks over the city, where our show was...... It was a basement club with good sound and a nice bar. The "big draw" on the bill, a legendary Czech old school band N.V.U. couldn't play, and a fill-in band played instead. That was the first sign of trouble, and to make a long story short, the guy that organized the show was very inexperienced; not many people showed up, time ran out, and both the PAWNS and Fourth Rotor had 40 minutes total to play before the show ended. Then, there was no money to pay us at all. There was some drama, until the promoter finally made good on gas money and a place for us to stay, and we made sure he knew he'd scewed up. We then drove to far eastern Czech to the Czech-Polish border town Csesky Tesin. It was a cool little town, very out of the way. The club was fantastic, and it may have been the best show yet: lots of people, many from Poland, and great energy. Heavy drinking started later that night, with everyone wanting us to do shots of vodka and slivavice with them. We held on the best we could. The next day, we headed to the town of Vlin for a show. From the map and location, we were certain it was going to be a tiny little village, and we'd imagined playing in a barn or something. Much to our surpise, when we found Vlin, it was in he middle of suburban sprawl, complete with houses, apartment buildings, glass & steel office building, and several Carefours, the Wal-Mart of Europe. This sprawl went on and on for miles in all directions. Despite having our quaint predictions shattered, the club, when we finally got to it, was again, great. It was already filled with about 150 people, and the show was amazing. There was finally a local opening band (somethingly oddly rare on this tour), and they we really original and interesting. The place went crazy for both bands, and despite someone stealing a couple CDs and a T-shirt from the merch table, it was good all around. I (Douglas) started my second turn with "the cold that never dies" and started to lose my voice. As I write, we're preparing to head to tonight's show, and the plan is that Jacob will sing all the songs, to save my voice for the rest of tour. Let's hope it works. We have left Germany, and are in the Czech Republic. Since last post, we played in Leipzig, Germany, at a great squat called 'Zoro'. We met an old friend from Chicago there, who runs a record store and helps with shows. The show was sparsely attended, but fun. We had the most fantastic meal of tour, with vegetarian lasagna, salad, fried egg plant, and chocolate cake. After Leipzig, we crossed into Czech with no problems at the border. I thought we'd made a wrong turn into 'Czech o whore vakia', because for several kilometers after the crossing, there were scores of prostitues and 'red houses' showing their goods....We made it into the small town of Chumotov, 1 hour north of Prague, and to the little local bar where we were playing. Despite being an intensly smoke filled basement with noventillation, we had a great great show there. The language barrier was solid, with almost no English spoken, and no one in our party speaking Czech, but the international languages of beer and music bridged the gap. Today, we went into Prague and saw the city as much as possible.